Los Angeles Mayor Eric Garcetti is scheduled Monday to begin a 10-day trip to Asia, seeking to strengthen relationships and boosting investment and tourism in Los Angeles, his office says. The group of business leaders and city officials will visit Tokyo, Hong Kong, Seoul, Hanoi and Ho Chi Minh City, the former Saigon. Representatives of the Port of Los Angeles, Los Angeles World Airports, and the L.A. Tourism and Convention Board are among those who will be traveling with Garcetti. 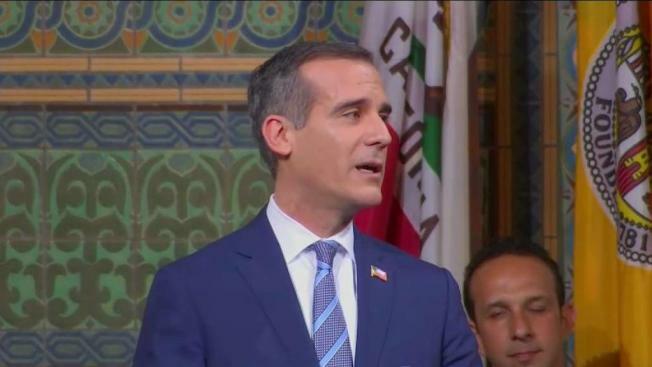 "Los Angeles is a global city with partners and interests all over the world -- and we have a special bond with our neighbors on the Pacific Rim," Garcetti said before leaving on his fifth trip out of the state in six weeks. China, Japan, South Korea and Vietnam are Los Angeles' four leading trading partners, Garcetti's office said. Trade last year between Los Angeles and Japan was valued at $40 billion; South Korea at $25 billion; and Vietnam at $19.5 billion, the mayor's office said. In 2017, Los Angeles accounted for 27 percent of all U.S.-Hong Kong trade, according to Garcetti's staff. Japan is also ranked as the No. 1 source of foreign-owned enterprises in the Southern California region with 2,541 firms, almost 86,000 employees and more than $5.3 billion in wages. Garcetti's office noted that Los Angeles County has the largest Asian-American population of any county in the United States at 1.5 million, or 15 percent of the county's total population. Last year, an estimated 1.1 million visitors from China, 342,000 from Japan and 315,000 from South Korea came to Los Angeles County. The World Trade Center Los Angeles and Los Angeles Business Council are organizing a business delegation to join the trip. Garcetti's office said the Port of Los Angeles and Los Angeles World Airports will pay approximately $155,000 and $164,000, respectively, of the approximately $319,000 cost of the delegation's trip. Additional funds will be provided by corporate sponsorship of events, but members of the delegation who are not city employees will be paying their own expenses.